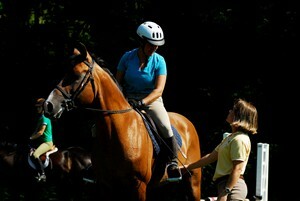 Students in the Riding Master program are scheduled in two riding classes each day. To begin each quarter, you will spend the first three days getting oriented and being evaluated by the staff. This will allow them to place you into a class that will challenge you as a rider. You will ride two different horses in your riding classes and, as you heard earlier in this tour, the turn around for horses here is high so instructors have the ability to keep you on horses that will challenge you throughout the quarter. Riding classes are scheduled in one of the indoor arenas, but, weather permitting, the students may have class outdoors instead. Wherever your class is scheduled, you will be with people of similar ability level and will work on a variety of skills depending on your level. Beginners may work on the position of their body, seat, leg rhythm, or lunge work. As you become more skilled in the area of riding, you will begin to require more from the horse you are riding. The objective of a rider in the program is to increase the capability to influence a horse to higher and higher levels of mental and physical accomplishments. 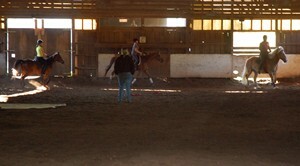 These riding classes will not exceed seven people in an arena and average five students. Meredith Manor does allow students to bring their own horses to the facility, but the staff does suggest that if you do bring a horse, you need to ride other horses to get the full benefit of the program. If you bring a horse to campus you may place it in the program as public or private. The prices for the different placements vary, view the catalog for a price list.